Hurricane Hermine made landfall Friday morning along Florida’s Gulf Coast, battering northern portions of the state with powerful winds and heavy rain, and leaving tens of thousands without power. 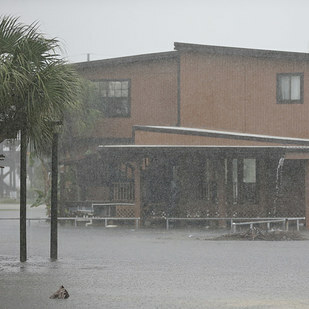 The hurricane initially hit just east of St. Marks, in Florida’s Big Bend region, around 1:30 a.m. ET, the National Hurricane Center said, becoming the first hurricane to strike the state since 2005. The Category 1 storm was packing maximum sustained winds of 80 mph. By 5 a.m. ET, the storm had weakened to a tropical storm as it moved further inland and into Georgia with maximum sustained winds of 70 mph, according to the National Weather Service. The storm is expected to move across Georgia throughout the day Friday and move into the Carolinas at night and into Saturday. Storm surges and coastal flooding warnings were still in effect Friday morning with some areas of Florida at risk for water rising as much as 9 feet above ground during high tide, the National Weather Service said. In a press conference on Friday, Gov. Rick Scott confirmed that a homeless man was killed by a fallen tree. The Ocala Star-Banner reported that the man had been sleeping in a tent when the tree fell on him. On Thursday, residents were urged to prepare as Hermine barreled toward the state, prompting evacuations and officials to warn of a “life-threatening” situation. A hurricane warning was issued for Florida’s Big Bend from Suwannee River to Mexico Beach, and a tropical storm warning was in effect for Florida’s Gulf and Atlantic coasts, stretching to North Carolina. Officials started to severe affects from Hermine in the state around 6 p.m., and it made landfall around 2 a.m.
Two Florida counties — Franklin and Wakulla — were issued evacuation notices, according to the Tallahassee Democrat. 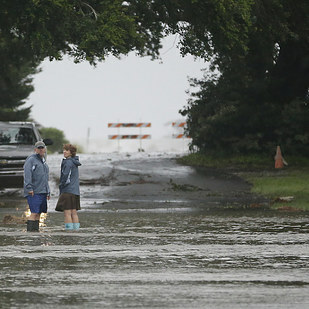 The city of St. Petersburg was one of the first places to experience flooding in low-lying areas, while in Tallahassee tens of thousands of people lost power, the Associated Press reported.